Jazz Phrasing for Saxophone - Volume 2 features ten melodic pieces which are easy to play, yet convey the essence of mainstream (Swing/Bebop/Bossa) jazz vocabulary. The pieces are catchy and melodic, demonstrating the use of sequence and voice-leading to make a musical statement. The book includes two play-along CDs (one for alto and one for tenor) featuring a world-class rhythm section, plus Greg Fishman demonstrating each piece. In addition, there are play-along tracks with just the rhythm section, so students have the option of playing along with Greg Fishman or with just the rhythm section. 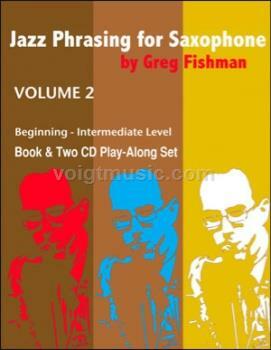 Jazz Phrasing for Saxophone is the "prequel" to Greg Fishman's more advanced books, Jazz Saxophone Etudes and Jazz Saxophone Duets, and will provide valuable insights into a melodic approach to jazz improvisation. This book is recommended for saxophonists of all levels who wish to improve their tone, articulation, phrasing, and understanding of thematic development. Special Features of Jazz Phrasing for Saxophone: • Suggested Use Section - Provides detailed instructions on a variety of ways to work with the book. • Idiomatically Correct - Both Alto and Tenor read the same written part - every song is in the perfect register. • Style & Analysis Section - Provides clear, concise explanations of sequence, variation and voice-leading • Thematic Index - Lets you compare the opening themes of all ten songs in a convenient two page "at-a-glance" format. Also includes detailed information on the opening interval of each song, as well as harmonic context of the opening interval. Endorsements for Jazz Phrasing for Saxophone: "Greg has done it again. Great melodies, interesting rhythms and beautiful chord progressions. This is the perfect foundation for learning jazz." -- Jamey Aebersold "This book is a monument to Greg Fishman's superb teaching skills, as well as his clear understanding of the jazz student's early needs. He has purposefully selected accessible tempos, significant melodic rhythms (with their appropriate phrasing) and sensitive note choices, utilizing commonplace chord progressions within the jazz repertory, all impeccably demonstrated by Mr. Fishman on the accompanying compact discs. This book is a must for the early conditioning of jazz students!" -- Jerry Coker "These melodious etudes are technically accessible to the beginner, who also gets the opportunity to blow alongside a very tasty professional rhythm section. Combine that with excellent performance tips and Greg's on-the-money demonstration tracks and you have the perfect book for the novice jazz saxophonist." -- Gary Keller, Professor of Saxophone, University of Miami "Greg’s compositions are the perfect vehicles to illustrate how to connect simple phrases with good voice-leading. They clearly show beginning and intermediate improvisation students the best way to understand the process of speaking the jazz language." -- Mark Colby, Saxophone Professor, DePaul University and Elmhurst College "Greg Fishman has created a book of fun, well-written, catchy tunes in a variety of styles for developing jazz players---highly recommended." -- Dr. Gregory W. Yasinitsky, Regents Professor of Music & Coordinator of Jazz Studies, Washington State University Songs included in Jazz Phrasing for Saxophone - Volume 2: • Castlewood Terrace • Garfield Boulevard • Dayton Street • Hyde Park Boulevard • Pulaski Road • Orchard Street • Fargo Avenue • School Street • Lexington Avenue • Edgewater Avenue A few words from the preface of the book: Applying good phrasing to music is like using good punctuation in written or spoken language. It involves the grouping of ideas to make the meaning of the words clear to the listener. The words are grouped into sentences, and the sentences are then grouped into paragraphs. The same is true when interpreting a piece of music. Good phrasing requires a musician to interpret the notes he plays, and determine which notes need to be grouped together to form a complete musical idea. Each song in "Jazz Phrasing for Saxophone (Volumes 1-3)" is designed to train your ear to hear the logical grouping of phrases through the use of sequence and thematic development. While the art of good phrasing involves the interpretation of note groupings and their relationships, it also involves deciding where you’re going to take a breath. Read the following sentences aloud to compare examples of good and bad phrasing. Good phrasing, spoken in one continuous breath: “Ladies and gentlemen, it gives me great pleasure to introduce the senior class president.” Bad phrasing, spoken with extra breaths, disrupting the flow and grouping of the words: “Ladies and gentlemen, it gives (breath) me great pleasure to introduce the senior class (breath) president.” The difference between these two sentences is very similar to the difference between a professional musician’s phrasing and a student’s phrasing. Both may be playing the correct notes with the correct rhythm, but the professional musician knows how to group the notes in a smooth, flowing fashion, while the student takes breaths at random, not even aware that he’s disrupting the phrasing. Jazz Phrasing for Saxophone has been carefully designed to help you learn to phrase like a professional player. These are pieces that will be fun for all musicians who love melodic writing with good thematic development.